Samsung is reportedly moving closer to the production of its foldable screen phone. The company is believed to have shared plans with parts manufacturers regarding the upcoming handset. The scale of the manufacturing forecast suggests the device will be a small scale pilot release, with production beginning November. Samsung looks like it may finally be taking some tentative steps towards the manufacture of a phone with a foldable screen. According to The Bell, the company has shared its plans for the production of parts associated with foldable screen phones with relevant parts manufacturers. The plans suggest production is scheduled to start from November. According to the article, the parts are mostly those that will form the foundation of the phone — not parts related to the actual design. The article cites an industry source as saying that this is because Samsung hasn’t yet finalized the design of the device. The source also said Samsung is still developing both infolding and outfolding versions of the device and that the final design should be completed by June. This lines up with previous rumors that suggested Samsung showed both infolding and outfolding device prototypes with a 7.3-inch screen to clients at CES 2018. The number of parts ordered was said to be much smaller than those of Samsung’s typical flagship devices. Those devices are believed to have quarterly parts forecasts of around 10 million, but The Bell says the orders for this device is somewhere between 500,000 and 2,000,000 depending on the specific part. The numbers suggest it would be a pilot project. Samsung has previous when it comes to using pilot devices testing a new display technology. This would not be the first time Samsung has used a pilot device to test a new type of screen. The Galaxy Round was released in 2013 exclusive to South Korea and it was the first phone made by Samsung to feature the curved glass that is now ubiquitous across all Samsung’s flagship devices. 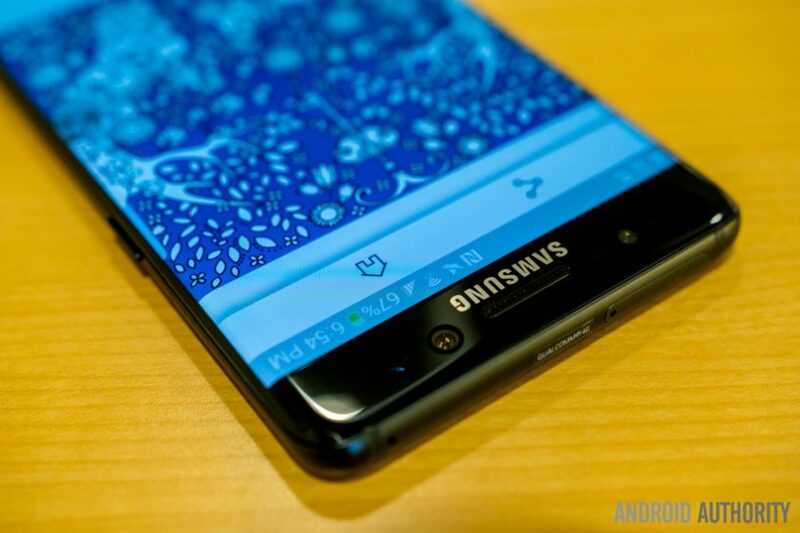 The Note Edge, released in 2014, was the first device to feature a curvature more similar to what we are now used to, although it wasn’t until the Galaxy S6 Edge, released in 2015, that the technology truly started to resemble the curved edge screens found on current Samsung phones. Should Samsung actually start manufacturing parts for the phone in November, that could potentially see the phone released early next year (mass production of the Galaxy S9 was said to have started in January before its release in March). However, Samsung is unlikely to rush things. In an interview earlier this year, Samsung’s head of mobile DJ Koh said that it would not launch a device with a foldable screen until it had “complete confidence” that the company was going to deliver the best possible mobile experience. This could mean that Samsung won’t end up as the first device manufacturer to unveil a phone with a foldable display. Recent rumors have suggested that Huawei is targeting a November launch for a foldable device. Next year would be an opportune time for Samsung to launch such a product, however, as it would also mark the tenth-edition of its Samsung Galaxy S lineup. Despite being a couple of years younger, the series has emerged as the chief competitor to Apple’s iPhone range, and given the splash the company made last year with its tenth-anniversary iPhone X (complete with a new display approach of its own), Samsung might want to capitalize on the opportunity to show-off how far its come. All of that being said, if there is one thing that the development of phones with a foldable screen has taught us, it’s that their release can always be put back further.